Days after receiving the experimental medication BIA 10-2474 in a first in human trial, one man was brain dead and another five hospitalized. According to recent reports, three are likely to have neurological deficits. To my knowledge, this is the first time since 2001 that a healthy volunteer has died in a medical experiment. And it is the first major drug disaster in a phase 1 trial since 2006, when six men were hospitalized after developing a life threatening (but not ultimately fatal) immune response to the drug TGN1412. Details surrounding the BIA 10-2474 trial are sketchy – and are likely to remain so as long as a manslaughter investigation is underway. Here is what we do know. The drug was a small molecule inhibitor of an enzyme involved in endocannabinoid metabolism, fatty acid amide hydrolase (FAAH). 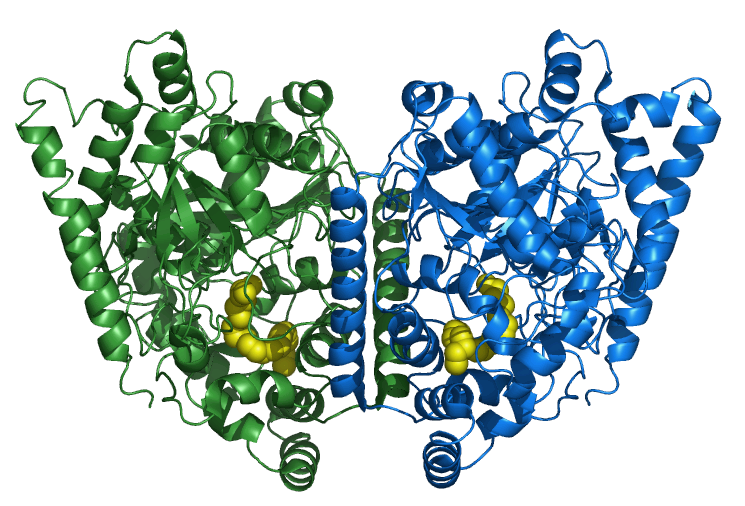 Other FAAH inhibitors have been tested in human beings without incident. Nor have any shown clinical activity. We also know that the men who developed life-threatening toxicities were the first to receive multiple doses of BIA 10-2474. And, based on a study protocol released by Le Figaro, multiple doses within this cohort were not staggered. Healthy volunteer phase 1 studies are creepy. The realm of phase 1 testing is secretive, and most studies are conducted in private contract research organizations rather than academic medical centers. Few studies are ever published. Indeed, drug regulators exempt companies from even registering them in public databases. This makes it difficult to know anything about their volume, record of safety, the demographics of study participants, or the nature of study procedures. Another reason phase 1 studies are creepy is that this is one of the few areas where doctors perform medical procedures – including administering unknown substances – that have no conceivable medical benefit for subjects. The risk/medical benefit ratio is infinite. All research on human beings, in a sense, treats people as (consenting) biological objects. But nowhere is this moral dynamic more stark than in healthy volunteer phase 1 trials, where people are valued not for exercising distinctly human capacities like labor or character – but rather for their biological passivity. Another reason phase 1 studies give one pause is the financial element. They are funded by one of the most profitable sectors of the contemporary economy: the pharmaceutical industry. And some of that economic might is used to recruit volunteers who are probably financially disadvantaged or underemployed. Based on the figures I’ve seen, you can make a handsome sum being a professional “guinea pig.” When I lived in Berlin, I visited a large phase 1 clinic operated by Parexel near Westend. It was one of the few places far outside the museum and Reichstag districts where one saw English signage. The signs were not trying to reach tourists, or native Germans. We should pay attention to this creepiness, but we should also discipline it with reason. Almost every modern drug we ingest – including many cancer drugs – began its human career in healthy volunteers. I’m hard pressed to think of any morally preferable alternatives to healthy volunteer testing if we value medical advance. Asking patients who are already debilitated by illness to commit their time and bodies for such studies is hardly more appealing. Based on what little has been published on them, healthy volunteer phase 1 studies are mostly benign medically. And I am not being an apologist when I point out that the medical screening procedures performed by Contract Research Organizations provide a service to precisely those populations that are probably underserved in primary care. Visit a phase 1 healthy volunteer clinic and you’ll see armies of people – of various races and age – listlessly peering at their laptops or plugged into ear buds, waiting around for the next blood draw. Phase 1 trials can and should be done better. The lack of transparency – including nonpublication – is unacceptable. Indeed, drug companies should be expected not only to publish their phase 1 studies, but also the preclinical research leading to them. In the case of BIA 10-2474, I have been unable to find a single published preclinical study of the compound. Indeed, I only learned of its composition through the leaked study protocol. In addition, there are probably many phase 1 studies whose contribution to the pharmacopeia is marginal, because drugs lack a sound biological rationale or are not directed at medically urgent applications. It is far too early to draw any specific conclusions about the conduct of regulators, BIAL, Contract Research Organizations, or the physicians involved in the BIA 10-2474 debacle. However, here are two interpretations I urge we avoid. On the one hand, we should avoid the temptation to explain events like this as inevitable, “long tail” phenomena. Some commentators argued this view after the TGN1412 disaster. It’s wrong, because behind every debacle is a chain of rectifiable human events that led to it. Every realm of risk and technology – airplane travel, nuclear power, chemical manufacture, mining – has proven it is possible to devise systems that render avoidable what some might call “inevitable” disaster. When all is said and done, the BIA 10-2474 debacle will reveal some correctable problem in the incentives, practices, organizational structure, and environment in which drug research is pursued. For the first time, STREAM will be co-hosting a workshop event with CIRST, the Centre interuniversitaire de recherche sur la science et al technologie. 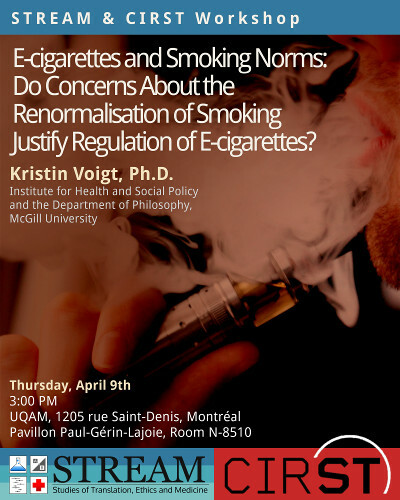 On April 9th at UQAM (see full location info below), Kristin Voigt will be speaking on “E-cigarettes and Smoking Norms: Do Concerns About the Renormalisation of Smoking Justify Regulation of E-cigarettes?” All are welcome, so please join us! Dr. Voigt received her DPhil in political philosophy from the University of Oxford and has held post-doctoral positions at McGill, Harvard, Lancaster University and the European College of Liberal Arts. Her research focuses on egalitarian theories of distributive justice and the links between philosophy and social policy. Her recent and ongoing projects address issues such as conceptions and measures of health and health inequality; the use of incentives to improve health outcomes; (childhood) obesity; higher education policy; and smoking and tobacco control. Jeremy Howick’s research draws on his interdisciplinary training as a philosopher of science and clinical epidemiologist. He has two related areas of interest: (1) Evidence-Based Medicine (EBM), including EBM ‘hierarchies’ of evidence, clinical epidemiology, and how point of care tests might improve practice; and (2) philosophy of medicine, including the epistemological foundations of Evidence-Based Medicine, and the ethics of placebos in trials and practice. 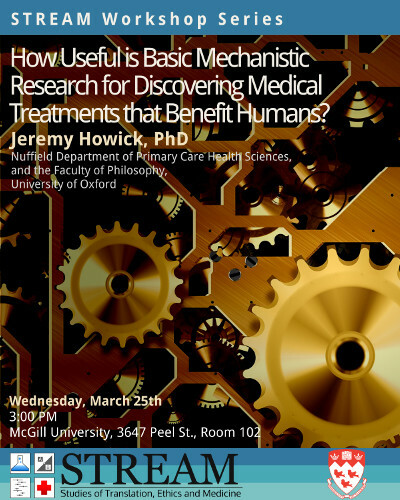 On March 25th at 3 PM, he will be speaking on “How Useful is Basic Mechanistic Research for Discovering Medical Treatments that Benefit Humans?” All are welcome, so please join us! James Overton is the founder of Knocean, a consulting and development service at the intersection of philosophy, science, and software. Example projects include ontology development and deployment, building semantic web tools, and developing custom web applications for scientific and medical projects. He specializes in scientific database integration using biomedical ontologies. 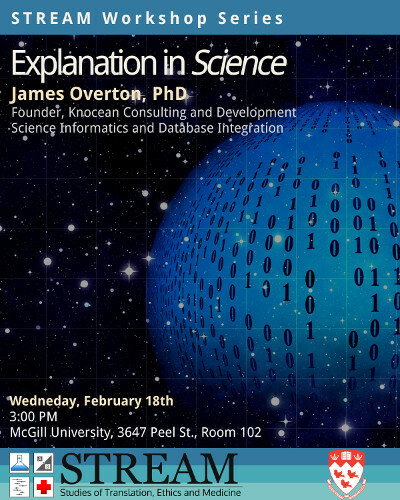 On February 18th at 3 PM, he will be speaking on “Explanation in Science“. All are welcome, so please join us! Charles Weijer is a philosopher, physician, and the Canada Research Chair in Bioethics at Western University. His academic interests center on the ethics of medical research. He has written about using placebos in clinical trials, weighing the benefits and harms of medical research, and protecting communities in research. 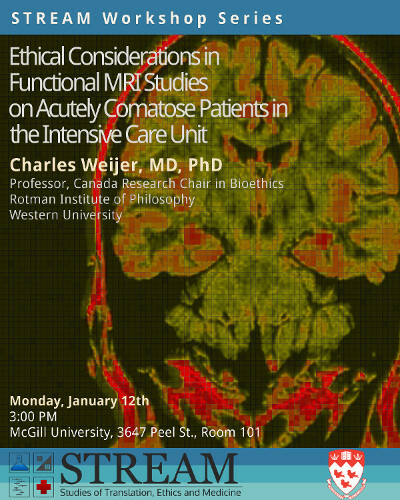 On January 12th at 3 PM, he will be speaking on “Ethical Considerations in Functional MRI Studies on Acutely Comatose Patients in the Intensive Care Unit”. All are welcome, so please join us!